What’s it like to be no longer in the first flush of middle age and suddenly facing life alone? Of course it’s painful, but it’s got its funny side. Meet Stella, who’s always had husbands and doesn’t intend to end up without one. Adam, who can’t remember his wife and is desperate to find something that will unlock the memory. Ben, caught in a three-way battle between his prostate, his libido and his conscience. And stoical Dottie, making the best of things and dispensing practical wisdom. 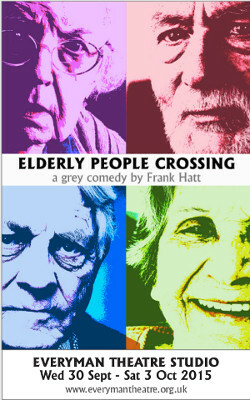 Four fascinating characters who happen to be old, their paths crossing and re-crossing. 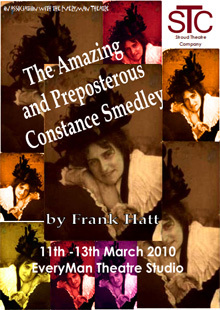 Grief sometimes seems to have unexpected consequences.Author Frank Hatt, director Chris Garner and Stroud Theatre Company return to the Everyman Studio five years after their sell-out production of “The Amazing and Preposterous Constance Smedley”. 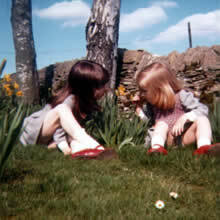 "The dialogue rang so true and I feel I know a couple of the characters. Beautifully staged and performed." "It is so true to life - particularly amongst those of us who are widowed"
"I really enjoyed your play and thought the actors did amazingly well. It was very brave of you to tackle the subject of bereaved spouses as it must have been very personal. Very thought provoking." "what a moving and thought provoking evening it was." "Such a compendium of poignancy and fun to which the amazing actors certainly did justice. The structure of the play was brilliant - I particularly liked the fast-moving scenes in the development (or otherwise) of the relationship between Stella and Ben. 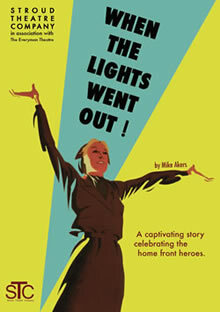 I do wish the play could be seen by a wider audience." 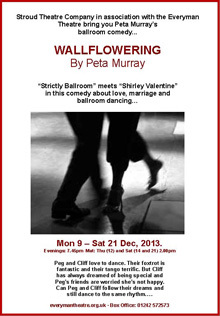 9th - 21st December 2013.
fantastic and their tango terrific. Peg’s friends are worried she’s not happy. still dance to the same rhythm….? 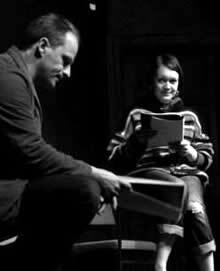 Directors: Chris Garner and Polly Teale. and Oxford Playhouse in 2013. Will be touring in 2014. Buxton Opera House and Tobacco Factory Theatre (Bristol). The play is based on events in the life of Constance Smedley, novelist, journalist, illustrator, playwright, theatre-worker and founder of the International Lyceum Club for Women Writers and Artists and the Cotswold Players. It spans the period 1903-1915.
turbulent periods in our country's history. during the dark days of World War Two. 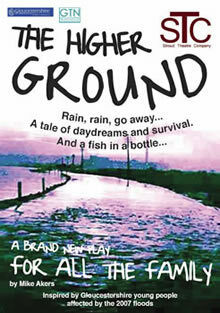 "The play using a minimum of props and excellently performed ... left us in no doubt about the gravity and dangers of rapid flooding"
People are preparing to defend their territory. Does it really exist? Is it possible to get there? Who lives there and more importantly will they help? Young people affected by the floods told their dramatic stories - sometimes funny, often frightening and occasionally very sad. 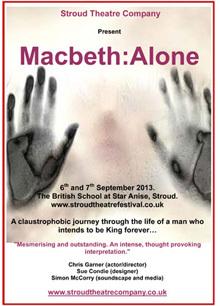 During the summer of 2006 Stroud Theatre Company invited script writers new and old to send us their scripts for this exciting new scheme. The closing date for scripts was Tuesday 31st October and 3 scripts were chosen to be given a Script in Hand performance by Stroud Theatre Company in 3 different venues throughout Gloucestershire in March 2007, accompanied by a post-show discussion with the writer and creative team. The Apple Pickers by Mark Young. Waning and Waxing by Lucy Heywood. 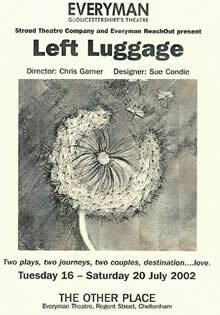 A One Woman show about a young woman and her invisible friend…. Toured nationally over two years 2000-2002, and was also performed at various mental health conferences throughout the country. 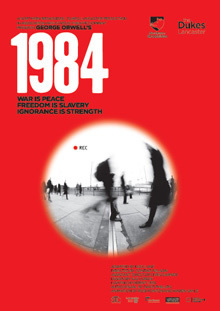 A Play in a Week for 8-12 year olds. 18 children enjoyed a full week of theatre activities resulting in a devised script and a bannered set created by the group. 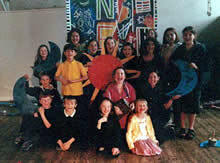 The show was performed to an enthusiastic group of parents and friends on the last afternoon. The creative team then collapsed and slept for 48 hours!! Bristol Old Vic Basement, Summer Season, 2000. A World Premier: Mother Country meets a collection of New Europeans and explores what happens when familiar borders disappear. 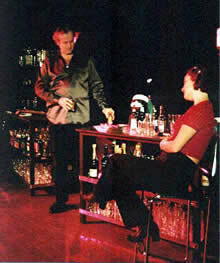 Bristol Old Vic Theatre, Basement, Spring Season, 2001. The show was inspired by a mystery trip to Puzzle Wood in the Forest of Dean. The children's ideas were pooled and then turned into a 40 minute drama. LX and Sound- Simon Spry. Technical S Manager- Corin Hayes.